Exercise provides one of the overall best solutions to the problem of stress eating. Not only do you burn excess calories and improve overall health, you also increase the level of the "feel good" chemicals known as endorphins, which elevate your mood and decrease your desire to overindulge in unhealthy foods. Plus, exercise gives you something to do other than eat. Next time you're tempted to snack, take a brisk walk instead. If you have a tendency to eat when anxious or depressed, a food journal can give you the accountability you need. To derive the most benefit from a food journal, it's important to write down every bite you put in your mouth without exception. It's also helpful to write down your mood and activities at the time you ate so you can be aware of any emotional triggers that compel you to reach for food. 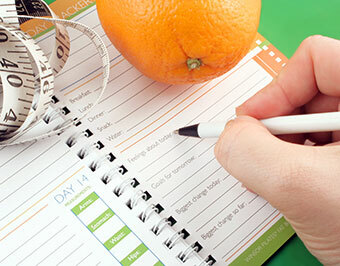 After two weeks of careful documentation, review your food journal and look for patterns. There are healthier and more effective ways to deal with stress that don't involve food. Take a class in meditation or yoga to help you manage stressful situations better. Learn to deal more directly with emotional issues by talking about them with family and friends rather than using food as a panacea. Food is only a temporary fix and not a long term solution. Use the power of scent to relax you and help to remove your desire to reach for food. If you're feeling down and are ready to reach for that piece of chocolate cake, take a quick whiff of peppermint oil. Peppermint tends to have an uplifting effect on emotions and can also help to suppress appetite. Don't forget about sugarless peppermint gum. This is an excellent pick me up and tasty appetite suppressant. Feeling anxious? The odor of lavender can help to relax you before you head for the freezer for that pint of ice cream. Playing soft, new age music in the background can also help relieve anxiety and prevent stress related eating. When the going gets rough and you find yourself reaching for the cookie jar, stop and reconsider the long term effects that small move can have and find a healthier way to deal with your problems.